“It smells a bit like death – like the macabre”. 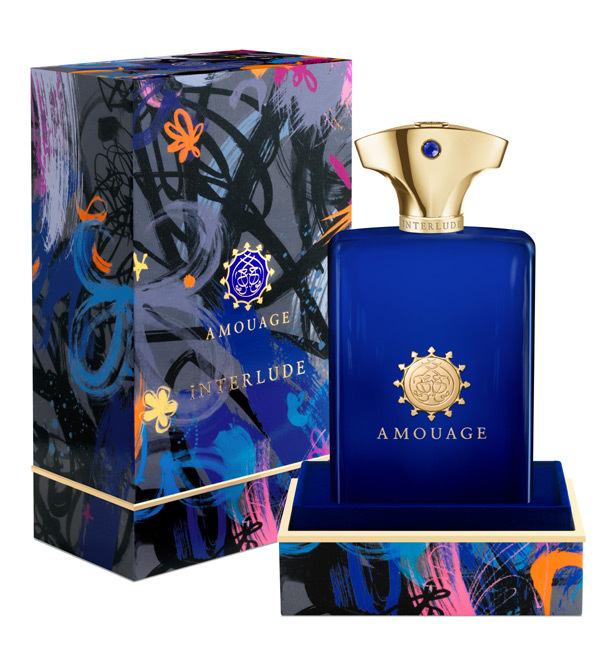 Through all the disorder and the discord, Amouage’s Interlude Man is actually pretty offensive. It’s dark. It’s somewhat cerebral in its creation. It smells a bit like my Grandfather’s shed. Dried oregano, motor fluids, ethanol and old wood – a dankly and cold opening of smoke moves from disorder to precise clockwork order. A burning tree accord, a smouldering bazaar and the clinical aspects of exotic agarwood – But when can you wear this? I still don’t know. Maybe never… But you see, it’s not bad, I actually quite like it. A bomb of the most officious notes in fragrance. Incense, amber, leathery labdanum, oppoponax, leather, patchouli, oud, sandalwood, oregano, pepper…. We’re in for a stinker! The theme behind this is to evoke a sense of disorder, whilst somehow maintaining a sense of balance and tranquility through the inventive use of incense and myrrh. Inventive?! Well – I think I understand the conceptual notions the nose had when creating this – but this is tenacious and very, very loud. Interlude Man opens with smoke, and more smoke, with a bit more smoke on top of that. The smog of black smoke in the opening contains oregano and pimento berry oil for good measure. This is combined with fresh pepper and bergamot (sound familiar?) that creates a green and medicinal opening with oud in there slowly unfurling. What pulses through is notes of everything else among the smoke; I feel the box art (above) visually explains my idea of ‘flecks’ and brushstrokes of things coming through at different times. What makes this unique is that it resembles a science experiment of wild and radical scent juxtaposition. Interlude Man certainly opens questionably green and black with the medicinal opening with smoke in the mix – but that smoke only teases you for the drydown. A burning tree accord; a smoldering bazaar in the exotic middle east… The smoke is perpetual (it’s a bit scary). The flecks of scent from each stage from opening to the deep drydown comes through with the smoke – but never preceding the smoke stage; I guess you have to accept it for what it is. With all the madness and all the chaos – the heavier notes come through that add a level of balance to Interlude Man. The oud is beautifully thick and exotic, with the creamy patchouli and sweet oppoponax/myrrh meddling nicely with the heavier notes of oud, smoke and incense. I can say with surety that this fragrance must be the darkest and heaviest scent I have ever smelt or worn. It’s disturbing… eerie even; very Middle-Eastern if that’s a thing. It has hints of dried fruit and ambergris in there too; this delivers some sweetness in the midst of it all; combine this with the sweet myrrh and we get some of the more liturgical aspects shining through – along with the sweet smell of burning tyre (each to their own). In a macabre sense, I think of William Peter Blatty’s “The Exorcist” – It’s akin to a relic that should not have been discovered and only leading me to have a religiously-fragrant existential crisis with myself. A fragrance of organised chaos, a bout between the fragrance social norms – this even pushes YSL’s M7 Oud Absolu out the window (Get it? The Exorcist!?) in terms of density, disorder and medicinal qualities. It has an undisputed church quality to it too…But now I’m blabbering. With all these tenacious notes in the mix, this beast doesn’t not work – because it does and I would wear this – when I would is speculative… but nevertheless it’s great for cold days and only cold days. It’s an incredibly warm balsamic, spicy, incredibly dense and the merest dab will last for the entire day – or in my experience, two days. Alternatives: M7 Oud Absolu by YSL; Black Afgano by Nasomatto; and a burning forest. Inventive and incredibly loud. A shocker at first with the eternal agarwood and smoke notes. I’m still befuddled. This entry was posted in Amouage and tagged Amouage, Fragrance, Interlude, Interlude man. Bookmark the permalink.